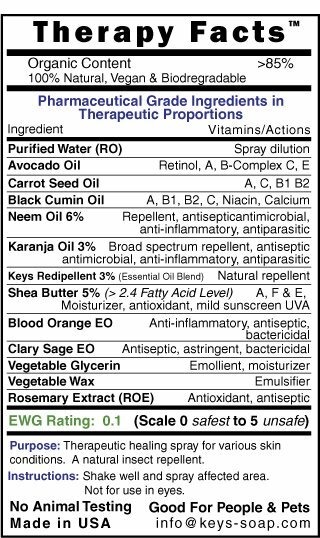 Redicare therapy sprays from Keys a clean, green, vegan, gluten-free, chemical-free company that does no animal testing. We are now carrying the Redicare therapy spray which is a spray on natural healing lotion containing Neem & Karanja combined with avocado oil, black cumin oil, carrot seed oil and high grade Shea butter. These natural ingredients provide a large area of coverage for people and pets. Redicare all natural, chemical-free healing spray can be used for allergies & irritations repels fleas, ticks, flies, mites & mosquitoes. Redicare has a refreshing earthy scent that was developed for pets & people. Currently our nine year old daughter is using it for her itchy eczema. Redicare healing first-aid spray heals skin disorders & pet hot spots. It is an excellent leave-in conditioner to detangle the hair and as a between bathing refresher for pets. The trigger style mini-sprayer is designed to cover larger areas with a fine mist of Redicare’s thick concentration.